The Robinson Memorial stands in a fire break in a remote spot within Kielder Forest, about 3 miles south of Kielder Water. It is a fitting tribute to the life and works of Lord Robinson (otherwise known as Sir Roy Robinson), who, though born in South Australia in 1883, spent a sizeable chunk of his existence dedicated to the forestation of Britain. Arriving in England in 1905, he followed an academic course which led him, eventually, to become the guiding light of the formation of the Forestry Commission in 1919. He spent the last 20 years of his life as its chairman, leading the charge for an extensive government plantation programme and the establishment of our National Forest Parks. He was handed an O.B.E. in 1918, knighted in 1931 and raised to the peerage in 1947. He seems to have had a special attachment to Kielder Forest, and even returned there in 1948 to fell the first tree! He also spearheaded similar campaigns throughout the Commonwealth, and even died abroad whilst leading a delegation to Canada in 1952. 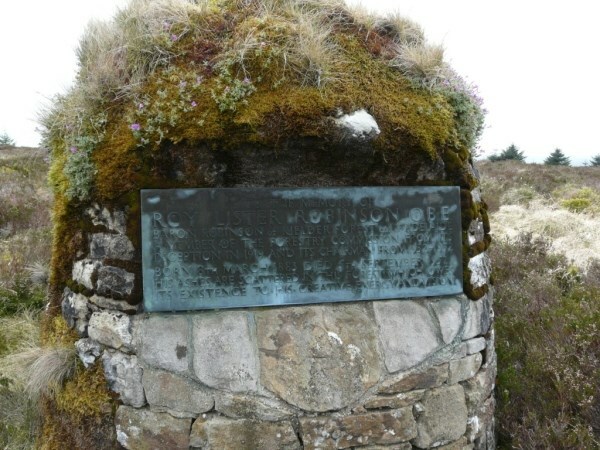 The following year his ashes were scattered in Kielder Forest, and the Robinson Memorial cairn now marks the spot. More info on this seldom-visited landmark can be found here and here. The Kielder Marathon, organised by Steve Cram, runs around the reservoir’s circumference. Red squirrel and many birds of prey thrive in the forest, including osprey – and lynx may be released there soon. Two miles NW of Kielder, where Bells Burn drops into the River North Tyne, lies the site of an enigmatic former religious site known as Bell’s Chapel, or Bell’s Kirk. It is very near to a curious twist in the Anglo-Scottish border – an area once deemed to be ‘in dispute’ and undoubtedly considered to be part of Scotland for various periods in its history. For centuries the spot has been labelled ‘Bell’s Chapel (site of)’, for it is now long gone. First mentioned in the 16th century, it was believed to have occupied the spot of an old pagan shrine of some sort. 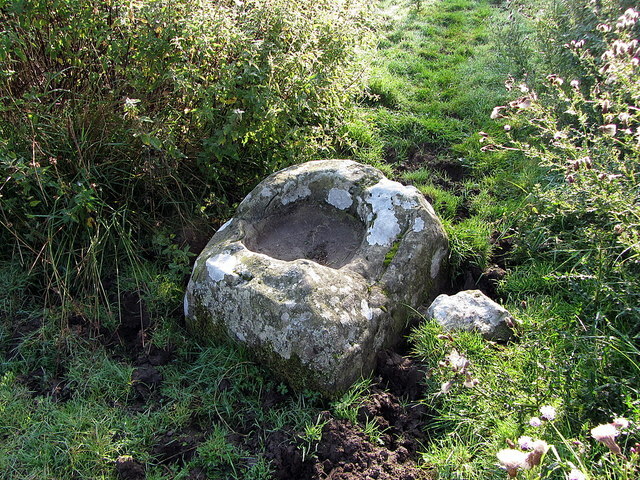 A writer in 1828 described that “every vestige of it has long since been obliterated, except some graves”, and all that remains today is what may (or may not) be the old font – pictured above. Nearby is an abandoned settlement (believed to have been called Bell, Bells or Bell’s House); and the spot was an important meeting place in the days of the Border Reivers. Catcleugh Reservoir sits in the upper reaches of Redesdale a few miles short of the Scottish Border. It is now dwarfed by its much larger and newer neighbour, Kielder Reservoir, but at the time of its construction during 1884-1905 it was a truly major concern. It was built for the Newcastle and Gateshead Water Company in order to feed the growing and ever-thirsty Tyneside conurbation – a series of tunnels, aqueducts and other reservoirs taking the water thus accumulated the 30-odd miles to its destination to the SE. The River Rede feeds the sizeable body of water, but such is the remoteness of the spot in question that labour and machinery had to be brought in from far and wide to complete the mammoth task. As a consequence of this, two hutted communities grew up in the shadow of the construction site, and were christened ‘Newcastle’ and ‘Gateshead’ for obvious reasons. A total of 40-odd huts straddled the two semi-permanent townships, housing more than 700 folk – workers, their spouses and their children. It was a tight-knit, rag-tag collection of individuals, who, nevertheless, maintained all the very basic social necessities of a village-like existence. It must have been tough, but there were dances, sports, drinking and gambling to be enjoyed, too … much of it quite illegal! Today a single workers’ hut remains, which houses an exhibition of the history of the reservoir and its little community of yore. But, most poignantly, in nearby Byrness Church (said to be the smallest in Northumberland) can be found a commemorative plaque and splendid stained glass window – the former listing the names of the 60+ individuals who died during the construction work, and the latter featuring images of the workers themselves. It was all paid for by the community itself, the window being unique in Britain in terms of its subject matter. An image of the church window can be found here. More info on the extraordinary Catcleugh scheme can also be found here. High in the Cheviots, where the A68 crosses the Anglo-Scottish border, lies the landmark spot known as Carter Bar. At this lonely venue those of the touristy persuasion stop their cars and take photographs of each other near the border stone as the flags of Scotland and Northumberland, respectively, whip furiously in the gale. Carter Bar is known for one famous historical incident: the Raid of the Redeswire. Otherwise known as the Redeswire Fray, or simply the Battle of Carter Bar, the brief encounter took place on 7th July 1575 and is recognised as the last major clash between the kingdoms of England and Scotland. The truth is, though, that it was little more than a skirmish. It all came about following a routine meeting of border officials, after which things got a little bit out of hand and a modest amount of blood was spilt (well, by battlefield standards of the day). The day’s events began when the English Warden of the Middle March, Sir John Forster, together with Sir George Heron (Keeper of Redesdale), and a few other nobles met their Scottish counterparts, Sir John Carmichael (deputy Keeper of Liddesdale and the representative of the Scottish Warden) and George Douglas (among others). There wasn’t really any ‘raid’ as such, as the get-together was a pre-arranged affair on a day of truce, during which the opposing sides would iron out any differences peaceably – it being the responsibility of the respective wardens to avert any angry exchanges. Both parties brought with them a small body of armed men for back-up – mainly pikemen and gunmen on the Scots side and bowmen on the English side. Englishman Sir John Forster had a reputation for double-dealing and there were live rivalries across both sides, so there was a certain amount of tension in the air. During a dispute about an English freebooter called Farnstein insults were traded between hothead Forster and the Scot Carmichael. The English bowmen got twitchy and let a few arrows fly, then all hell broke loose. The Scots were outnumbered but during the short fracas got the better of things – helped, it is rumoured, by the timely arrival of reinforcements from Jedburgh. Casualties on both sides were modest (George Heron and his brother were killed), but the victorious Scots took home with them several ‘prisoners of war’ – including the cad Forster – though they were all subsequently released without harm. Within a few years, of course, the Crowns of the two kingdoms were united and all such incidents were cast into history. Well, until Wembley 1977, that is. Note: Ten years later, in July 1585, there was actually another truce day ‘fray’ which took place at Windy Gyle, a border spot several miles NE of Carter Bar (NT855152). As far as I can tell, only the one fatality was suffered as a result of an unruly Scottish charge: that of Englishman Lord Francis Russell – though there was a rumour at the time that his demise was a ‘put up job’ to incriminate the opposition. Either way, it must be assumed that a single death did not qualify this as a ‘proper’ battle between the two nations! A cairn bearing his name lies near the blustery spot in question.